Someone has Actually Rivaled Martin Gramatica for Pooniest Sports Injury of All Time. Wow. I feel like Ron Burgundy- I'm not even disappointed, I'm just impressed. This guy did something I thought was impossible. 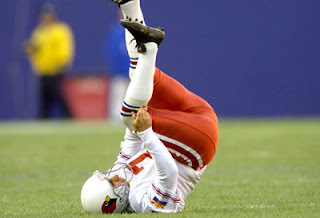 After seeing Martin Gramatica tear his ACL while celebrating a first quarter field goal in 2001, I swore that would forever be the pooniest thing I ever saw on a sports field. This ballbag in the MLS broke his leg while celebrating his goal with a backflip. What outpoonies Gramtica's injury is that this guy's goal was called off due to him being offsides. 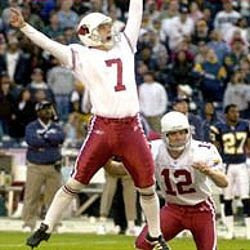 At least Gramatica's field goal counted. The goal and subsequent backflip occur around the :48 mark. Also check out how much Gramatica looks like Don Flamenco.